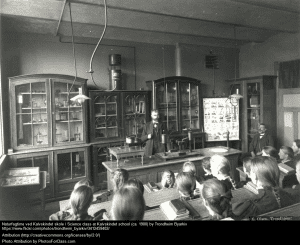 Is “The Scientific Method” Good Enough for Today’s Science Classroom? 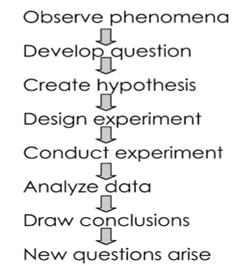 Do you think The Scientific Method is too linear or too rigid for the science classroom? Tell us below or tweet @learnquebec. I had the privilege of attending a talk given by Dr. Joe Schwartz at the recent Teachers’ Convention in Montreal. He decried the lack of scientific process in the anti-scientific claims of the pseudo scientists who make enormous profits from non-traditional medicines like homeopathy or use scare tactics to promote opposition to vaccinations for young children. His position is that when these fake sciences are put through a rigorous scientific process (if ever), they fail to produce the results to back up their claims and are in fact fraudulent. So what is the role of science teachers in helping students navigate the claims of scientists and non-scientists that are out there? Most science and technology teachers are very conscientious about making sure that their students have ample opportunities to do “hands-on” science activities whether in their classrooms or in specially-equipped science labs. This requires them to prepare lab experiments for their students involving extensive amounts of time developing procedures, gathering materials and instructing their students on the expectations. In my discussions with them, they make it clear that students’ understanding of the process of science is as important as their knowledge of the scientific “facts”. In fact, science educators are conscious of the fact that it is their role to help their students become scientifically literate, in order to better understand the scientific processes that allow society to discriminate between science and superstition, between medicine and quackery, between truth and fraud. Critics say that, as it is used in the classroom, TSM is too linear a process and that it does not mimic the way scientists really work. The way it is applied in schools may be too simplistic and may not promote inquiry. For example, the statement of the problem is often too clean and simple, not the messy reality of true science. Hypotheses are often done for the sake of having one and are often unrelated to existing models. Derek Hodson in a 1996 article in the Journal of Curriculum Studies points out that scientific processes must be carried out within “a substantial measure of theoretical knowledge” otherwise predictions are only guesses. “In reality, doing science is an untidy, unpredictable activity that requires each scientist to devise her or his own course of action. In that sense, Science has no one method, no set of rules or sequence of steps that can and should be applied in all situations.” All too often in our classrooms, procedures and conclusions are too simple. The steps are all listed clearly and the results are the expected ones. Inquiry-based learning requires much more. I had a recent discussion with a friend and science consultant. She pointed me to an article by Mark Windschitl and colleagues in a 2008 article in the journal Science Education saying that schools need to present scientific inquiry in a much more realistic way than TSM. In their Model-Based Inquiry (MBI) paradigm, they talk about 4 conversations to take the place of TSM. Organizing what we know and what we want to know. This involves exploring what is already known – establishing a model of this. Generating testable hypotheses: This means thinking more deeply about what might happen and why. Understanding that there can be competing explanations and methods of attack. Don’t just guess! Seeking evidence. This involves using data from different sources, establishing models and deciding how to represent the data. 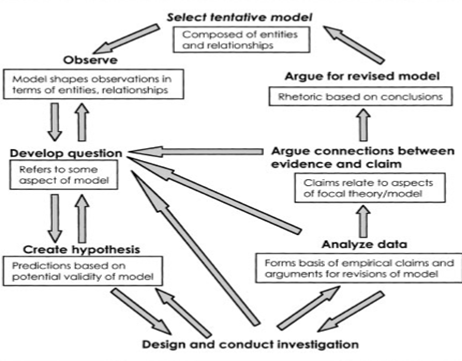 Below is a diagram (again copied from Windschitl (2004)) of Windschitl’s Model- Based Inquiry. If you start at the top and go counter clockwise, you will see that the process of formulating a hypothesis takes into account the existing understandings and current theories and observations. As the investigation is carried out and the data analysed, the original question(s) and model(s) are revisited and adjusted with the new findings and conclusions in mind. These revisions happen at any stage of the process – unlike the TSM linear process. So if TSM isn’t producing the scientifically literate students we want, then what should teachers do in the classroom? As science educators, we know that we need to not only interest and challenge our students in science with good inquiry-based hands-on activities. Activities need to be as diverse as the real-life science they mirror, and include reading about science, presentations of science phenomena, debating, demonstrations, videos, thought experiments, etc. MBI can provide the methodology for those good classroom lab activities. Stay tuned as I continue to look at inquiry-based science teaching and learning in upcoming posts. Hodson, D. (January 01, 1996). Laboratory work as scientific method: three decades of confusion and distortion. Journal of Curriculum Studies, 28, 2, 115-136. Windschitl, M. (2004), Folk theories of “inquiry:” How preservice teachers reproduce the discourse and practices of an atheoretical scientific method. J. Res. Sci. Teach., 41: 481–512. Windschitl, M., Thompson, J., & Braaten, M. (September 01, 2008). Beyond the Scientific Method: Model-Based Inquiry as a New Paradigm of Preference for School Science Investigations. Science Education, 92, 5, 941-967. I agree Chris. We’re bombarded by the claims of bad, fraudulent science based on incomplete, anectotal or deliberately misleading findings. Teaching our students that the scientific process involves gathering solid evidence is an important part of the path to scientific literacy. What I find most interesting in the “scientific method” is the part that’s not methodical at all: the designing of the experiment. It’s a process that involves creativity, bridging the exaggerated gulf between science and art. Yet because “discovery prefers the prepared mind”, I’ve seen even top students get frustrated when they are first asked to come up with their own procedure. But there are ways around it–giving hints with regard to equipment—or first showing them variations that won’t work. There was a CEGEP teacher, now retired, Harry Wilson, who was very keen and successful on this sort of thing. It’s a tragedy that it did not catch on—from what I gather, the cookbook-approach still rules! Yes, teaching is an art, Enrico. Part of the art of being a good science teacher is knowing how to lead students into inquiry. Moving from cook-book procedures toward student-developed activities is an important part of that. Thanks for your comment.